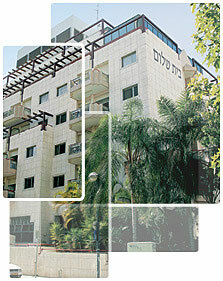 Reuth Beit Shalom is a high-quality retirement home for the religious-Zionist sector, well placed at the heart of Tel Aviv. Located within walking distance of the beach and the commercial centers on Dizengoff St., it is also conveniently close to many essential services and the city's main cultural attractions. Occupying a modern 7-story building, the home offers 70 residential units for singles and couples, a religious lifestyle conducted around an active synagogue and a large selection of cultural and social activities. Health services are provided on the premises by a professional team of geriatric specialists, nurses, a physiotherapist, an occupational therapist and a nutritionist. A special nursing department with 25 beds cares for tenants who require round-the-clock assistance.